No Burns Supper would be complete without a piper to pipe in the haggis. The Supper, on January 25th, is a celebration of Scotland’s most famous poet, Robert Burns. 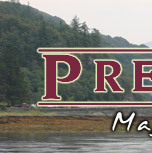 Pipers are in huge demand for Burns Suppers and you are advised to book well in advance. Contact us now to secure a piper for your Supper. We are especially happy to help organise a Supper for tourists or people holding their first Supper. The piper plays a central role, whether it’s a formal Supper or a raucous bash. Robert "Rabbie" Burns 1759 - 1796 is our best loved Scottish poet, famed as much for his womanising and drinking as much as for his beloved poetry.Born the son of a farmer, born in a cottage in Alloway in Ayr, this cottage is now a museum, dedicated to Rabbie. Burns Night is a great occasion on January 25th when many dinners dedicated to his memory are held all over the world. The piper plays "My Love is but a Lassie Yet" as he leads in ‘Poosie Nancy’ (one of Burns’ favoured landladies) carrying the haggis. A reciter reads the address ‘To a Haggis’, before he, Nancy and the piper down a whisky. The piper then leads the procession out and the meal of haggis, mince, tatties and neeps is served. 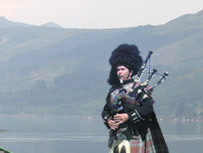 The piper can also play a selection of Burns’ work or other traditional and contemporary Scottish music. He also plays a vital role in the rendition of Auld Lang Syne at the end of the evening. To add a final touch, we can provide a fully-costumed Rabbie Burns to recite Scotland’s finest poetry.